Should you want to take your dog from one place to another, you’ll need a good carrier. Here we take a closer look at the Aspen Pet Pet Porter Plastic Kennel. It’s sturdy and durable, yet delivers excellent quality without compromising on style. There are many things to consider when you decide to buy any pet carrier. Firstly, it has to be the right size. Then you’ll want to make sure your plastic kennel is secure, and your pet won’t be able to get out. Most of all, it needs to be comfortable for the animal you are carrying. Finding something that fits all these criteria at a decent price is not easy. Here we’ll take a closer look at the Aspen Pet Porter, including which breeds of dog it suits best and what size kennel to buy for superior comfort. CLICK HERE to Find Out What Amazon Customers are Saying About It! 1.1 Who Are Aspen Pet? 1.2 What Are the Sizes and Colors? 1.7 Should I Buy It? It is rare that you find a plastic pet kennel that comes in enough sizes to suit almost any dog breed. While the larger kennels are not suitable for carrying because of the weight and size, this is still a great all-rounder for pet owners. You can house or transport pets of all sizes including small birds, guinea pigs, puppies, and kittens. The larger models are ideal for Labradors and Alsatians, both for indoor and outdoor use. One thing you don’t want to compromise on is quality. The AspenPet Pet Porter is made from hard plastic, but that doesn’t mean there is any loss in comfort or design. There’s a large metal door which provides a good opening, so there’s ventilation for your pet. AspenPet is part of a larger company called Petmate. They develop all sorts of products for dogs, cats and smaller pets like birds. Petmate has been around for over half a century, so they know a thing or two about making kennels, carriers, and toys. They’re also one of many US companies that now embrace eco-friendly practices. So, if you’re looking for a product that’s also green, they’re well worth a second, or even third look at. What Are the Sizes and Colors? One of the good things about the Aspen Pet Pet Porter Plastic Kennel is that it’s available in so many sizes. There are nine different options. 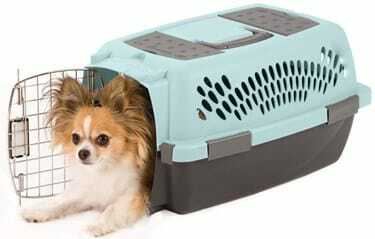 The smallest kennel is 19″ x 12.6″ x 10″ and suitable for animals up to 10lbs. That could include pets such as guinea pigs and hamsters. If you are looking for a kennel for your small dog, there’s the 23 inch or 24-inch porter. These are also suitable for cats. The sizes increase gradually up to the largest which is the Pet Porter 40. Measuring 40″ x 27″ x 30″ it’s ideal for medium to slightly larger dogs. When you have a small pet, another kennel that you might like is the Petmate Two Door Top Load Pet Kennel. 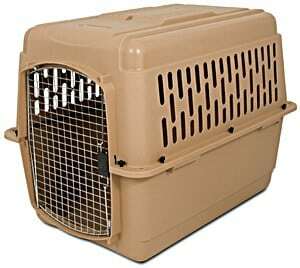 It is a small carrier/kennel, and it has a top door so that you can easily lower your pet into it. Unusual for a plastic kennel, the Aspen Pet Porter comes in 9 different colors across the range, including deep red/black and blue breeze/black. Any pet product has its pros and cons. With a durable plastic shell, this stylish kennel from AspenPet can deliver on what pet owners are looking for. Don’t worry though as we’ll also take a look at a few of the disadvantages. A strong looking kennel that is made of hardwearing plastic held together by metal screws. Available in a wide range of sizes to suit a lot of different pets, including dogs and cats. Despite the durable material, these are lightweight kennels. The smaller varieties come with handles for easier transportation. There are plenty of ventilation points, including the front door trap, making sure your pet is kept safe and comfortable. The plastic base and frame are straightforward to clean and maintain. This is an airline approved kennel, but you should check before booking your ticket. The latch is secure but easy to open with one hand for busy pet owners. The larger dog kennels can quite easily take animals up 90 lbs. This is the kind of kennel that is ideal for transporting your dog on an airline. For long car journeys or trips to the vet, the kennel fits neatly onto the seat or in the trunk and can be secured easily using seat belts. It’s also a good choice if you want an outside kennel or shelter for a medium or large dog. All sizes work well if you have a pet that you need to transport to the local vet or take a short distance. The dimensions given online are for the exterior of the kennel, so you need to take this into account when choosing the right one. Some sizes only come in one or two colors which can be a bit limiting if you like more design choice. There can be a problem with excitable dogs that love to chew as they may well be able to work their way through the plastic. This is a plastic pet kennel that works for all sorts of pet owners. It’s ideal for small dogs up to larger breeds as well as cats. Larger kennels can take more than one pet as long as they get on with each other. It’s suitable for a range of different pets. One customer bought the Aspen Pet Porter for their two ferrets and found it a really good product for taking them on long journeys. It’s not just a product for travel. The plastic kennel can be used both indoors and outdoors to provide shelter for your pet. In part, because this product comes in so many sizes, it’s proved popular with a wide range of pet owners. The Aspen Pet Pet Porter Plastic Kennel is also durable and secure while coming in at a price that doesn’t break the bank. Every cat and dog owner tend to buy at least one carrier or kennel for their favorite pet, and they expect it to last. 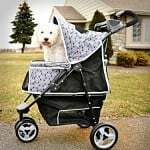 A lot of the customers for the AspenPet Porter say that it is a sturdy and durable product and one which they are glad they purchased. The range of sizes available makes it suitable for the vast majority of dog breeds. One customer reported that it was ideal for their 9-month-old German Shepherd. You should note, however, that larger versions of the Porter Kennel do not come with a handle and are not designed to be carried. A lot may depend on the personality of the dog you have. Some are more likely to gnaw and be a little destructive in a confined space. The Pet Porter Plastic Kennel isn’t necessarily the best product for them. If your dog has been acclimatized to going in kennels and settles down reasonably quickly, it ticks all the boxes, however. While the majority of buyers have purchased the kennel for either a cat or dog, other pets such as ferrets, rabbits, and guinea pigs can also be transported in the smaller ones. 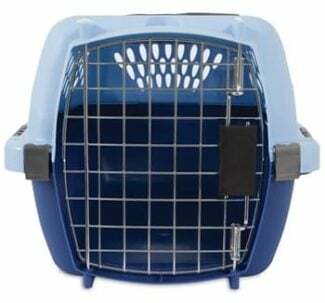 If you’re looking for versatile pet carrier and have many pets at home, this seems to be a good item to purchase. The question of whether the carrier was fit for airline travel was also raised by many customers. While the AspenPet Pet Porter smaller models work for some airlines, there is only ventilation around three sides of the carrier. Some airlines stipulate that you need all four sides ventilated. Some complained that there wasn’t the facility to load in pets from the top. This is something that cat owners, in particular, tend to value and is perhaps a design change that AspenPet can look at in the future. Overall, however, most customers found the Pet Porter a good all-purpose carrier and kennel for their animal. It comes at a relatively affordable price compared to other products in the same category and is reasonably stylish with different color combinations available. One thing you do need to be aware of when choosing this kennel is that all the measurements are of the outside. Take that into account when you are deciding which size product to choose. There are two measurements you should take for your pet. The first is from the top of the head to the floor. Ideally, you want a crate that is at least 2 inches higher than this. The second is from the tip of the nose to the base of the tail. You’ll want a kennel that is between four and 6 inches wider and longer than this to provide enough room to move around. 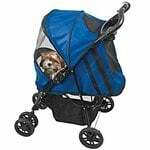 This is a good purchase if you are looking for a long-lasting, regular carrier or kennel for your dog. The Aspen Pet Porter Plastic Kennel is available in a broad range of sizes, so it’s suitable for small pets up to medium size and larger dogs. The small, portable ones have handles which can be used to transport your pet. The larger sizes, because of their bulk, don’t and are better used as kennels or for use in the car. If you’re buying one pet porter, this is a good one to investigate more thoroughly. CLICK HERE to Buy this Pet Kennel on Amazon!